I’ll take the Elevator ! 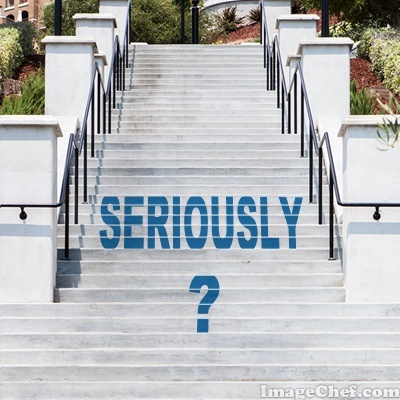 What are We Going to do About Getting up Those Steps? Arthritis is a terribly painful condition. It is basically an inflammation of the joints. Osteoarthritis causes the cartilage, that is supposed to protect the bones from grinding together, to break down. I have osteoarthritis and I feel like the bones just grind together in my knees and my hips. Going up the steps feels like something is stabbing into my right hip and both of my knees. 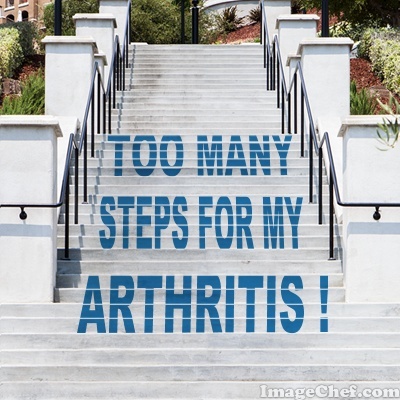 It is so painful to walk up and down the steps that I lean against the wall and stop every couple of steps to allow the pain to stop for a few seconds. My arthritis is about 20 years beyond my age, according to the doctors. The reasons for this are something we could speculate about , but some of it is because of the overuse injuries, I constantly sustained at the nursing I worked at, a few years ago. They forced us to do heavy lifting by ourselves and even violated the law, and the OSHA regulations about lifting. This is typical for nursing homes and many people I know were injured. I saw many back and shoulder injuries. I also had shoulder injuries and constant microtears to the muscles. I have a herniated disc in my neck which I do not think was cause by the job, but was probably exasperated by the lifting of heavy patients on a regular basis. There are two huge flights of steps to get up to the top floor where I live, in the house I am renting the space from. It is a huge undertaking for me, everytime I have to take down the trash, take down and bring up the laundry and take up the grocery bags. Each step is pain and I feel like I cannot survive living with these steps any longer. The next place I live must have a main entrance that I can bring groceries into and do laundry all on that floor. Both main types of arthritis are equally painful. Osteoarthritis eventually begins to wear down the bones, which is where I am at now, with certain joints. There can also be bending of the bones, basically deforming the shape, like I have in my right foot. It is beginning to bend inwards at the top, which causes balance problems in addition to the PTTD (posterior tibial tendon dysfunction – flat foot and ankle collapse) that is continuing to get worse in my right foot. It is very hard to balance, especially on uneven ground. There are other types of arthritis but they are not as common as the two main types I discussed here. Arthritis is painful and the best treatment I have found is putting heat on the area. You can use ice to reduce inflammation. Limit heavy lifting, which is easier said than done at the job I work at now. I am working on making a change to having my own business, so I will have to lift and cause more injury to the joints. I also have degenerative disc disease, which can begin with arthritis and mine probably did. They do not really know what comes first. I asked the spine doctor if I had arthritis in the cervical spine first that caused the degenerating discs or if the degenerative disc disease caused the arthritis . He said they often are seen together and there is no way to know which occurred first. Herniated discs are a typical result of degenerating discs in combination with heavy lifting, which was unfortunately exactly my situation when I was doing the heavy lifting at the nursing home. The best thing to do is to take care of your spine. If you do yoga and spinal stretches every day, you will reduce your risk for spinal stiffness. You need to keep your spine flexible, the way it was meant to be. It is harder to get mobility back, than it is to maintain it. You cannot be fully well , unless your spine is in good shape.